Lease company MRCE announced its first order for fifteen Vectron AC locomotives in June 2013. On 05.12.2013 the first three black Vectron locomotives left the Munich factory for the first time. Since then MRCE has been raising the number of units in its fleet constantly. Mitsui Rail Capital Europe (MRCE), a full-service locomotive leasing company, has ordered 30 Vectron locomotives from Siemens. Ten of the units will be delivered as multisystem Vectron MS for cross-border operations in Germany, Austria, Italy, Switzerland and the Netherlands. Twenty further locomotives will be equipped as direct-current locomotives (Vectron DC) to operate in Italy. Delivery of the locomotives is scheduled to begin from January 2018. The contract with MRCE also includes an option for an additional 20 locomotives. “With this new order, our Vectron fleet will grow to a total of 111 locomotives. Our customers throughout Europe value the reliability and flexibility of the Siemens locomotive,” says Junichi Kondo, CEO of MRCE. “The long-standing trust of MRCE in Siemens shows that we have a locomotive in our portfolio that more than satisfies the requirements of European freight transport. With its fleet of DC, AC and MS locomotives, MRCE can now offer all electric versions of the Vectron,” says Jochen Eickholt, CEO of the Siemens Mobility Division. The ordered multisystem locomotives have a maximum output of 6,400 kW and a top speed of 160 km/h, and the Vectron DC has an output of 5,200 kW. Both versions are equipped with national train control systems and the MS locomotives also have the European Train Control System (ETCS). A 'Lastprobefahrt' last week with Siemens 247 905 gave us the opportunity to have a little peak into the future of the Siemens Vectron production. Siemens decided to use a batch of new Vectron electric units to serve as 'ballast weight' during the test runs. All machines are new and did not yet leave the factory gates. - new MRCE multisystem locos no. 193 655 and 193 656, so the production of the two batches of these locomotives is well on its way (the designated 193 640-650 and 651-660). - Alpha Trains 193 556 and 557 are finished. This means that the optional locomotives have been built right away after the first order was completed. First batch is Alpha Trains 193 550-555, four more will come. - The three Vectron for Polish PKP Cargo that were still missing are ready-to-go too. Unlike the twelve first machines, now in service, the designated 193 513 / 514 / 515 (or 5370 025-027) are additionally equipped for the Netherlands. Update: 247 905 has been handed over to InfraLeuna as a temporary replacement of 247 907, because Siemens will perform some finishing touches on the latter. Update 16.04.2017: After a trip through Switzerland, MRCE X4E-641 to 645 arrived in Chiasso. Brenno Arcara was able to take pictures of the transport in Mezzovico (CH). Daniele Monza makde in picturess in Chiasso. On 01.04.2017 we got the announcement a huge 'Lok-Zug' (loco-train) was out and about. Various people were on site and made beautiful images of this 13-Vectron consist. Almost all locomotives in this transport are new to us and have not left the Siemens factory perimeters before. But there is more. The consist also has the new MRCE Vectron MS locomotives X4E-646, -647, -648, and -651 on board. The whites are: 5170 021, an oldie used in Polen and four brand new ones with four pantographs, not identifiable yet, although they have these Siemens works numbers: 22039 (=Vectron 200), 22253, 22235 and 22209. Today Siemens has released the first Vectron locomotives for lease company Alpha Trains from its work in Munich. The designated 193 550 pulled the identical 193 551 and the black X4E-645, 634 and 644 for MRCE to Brennero. Although for different customers, all five Siemens multi system electrics have the same country specific package: Germany + Austria + Italy. We thank Ronny Bruns for the pictures in this article. Currently the full certification of the Vectron MS for Italy is showing progress. ANSF, in charge of the homologation of railway vehicles in Italy, recently gave green light for MRCE's X4E-640, so we expect more to follow soon. The 193 550 and 551 have the current Alpha Trains livery in lime green and silver. Both machines will soon be operated by railfreight company TX Logistik. To express the cooperation between lease company and its customer, both machines got additional stickers with the slogan 'Zwei Pole mit Enormer Zugkraft' (= Two poles with huge tractive power). Seen today by Tobias Schmidt at Basel Badischer Bahnhof: all new MRCE Vectron locomotive X4E-641 and -642. Tobias Unsin was able to catch the recently delivered X4E-640. The image shows the colorful locomotive on 15.02.2017 pulling the DGS 43155 Köln Eifeltor - Verona (with ES64F4-030) in Vogl (DE). Note that the livery of the 640 changed a little. The slogan 'Connected by rail' was removed from both fronts. The MRCE logo (left) and the painted number (right) got a new place. Seen today by Oliver Scholz in Munich: MRCE X4E-861, with boxXpress stickers. The locomotive was under repair during the last months, after its derailment in Beimerstetten [DE]. The locomotive ran over a scotch block and ended up in the railway ballast almost tipping over. Good news for Siemens, and its customers. The Italian railway authorities have granted approval for the multisystem version of the Vectron platform built for MRCE. This lease company has 21 Vectron MS locomotives on order, equipped for services in Germany, Austria and Italy (DE/AT/IT). The first batch of eleven, the designated X4E 640-650, is nearing completion. Freight operator TX Logistik took delivery of the first MRCE Vectron MS today in Munich. It is the X4E-640 in its colorful 'Connecting Europe' livery. You may have seen this machine at InnoTrans 2016. The approval of the Vectron multisystem locomotive for Italy is an important milestone. 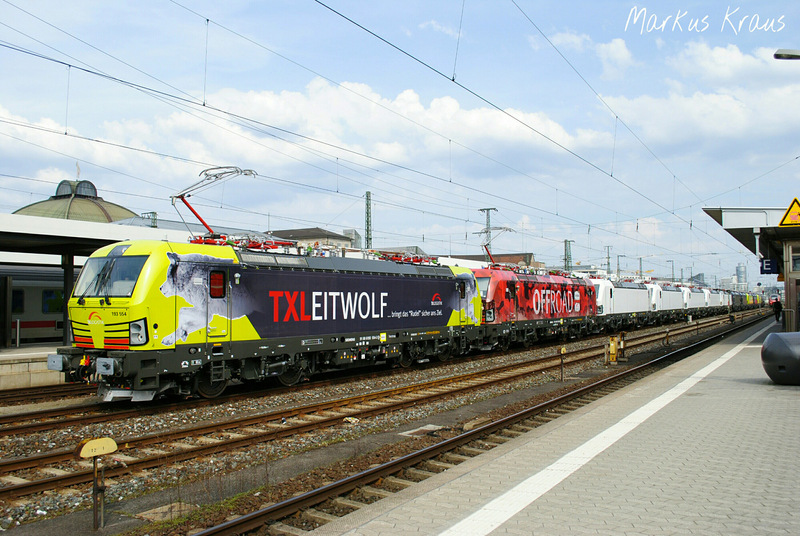 Next to MRCE, Lokomotion, Alpha Trains, ELL, BLS Cargo, Reichmut/SBB Cargo International and the Austrian Railways have machines (on order) that are to be operated in Italy. The DC version (3 kV DC voltage system only) of the Vectron is already authorized for Italy since july 2015. Tobias Schmidt caught this colorful duo on 27.11.2016 in Basel Bad (CH). The colorful MRCE X4E-640 is now on its way to Italy together with ELL > SBB Cargo International 193 257. Martin Voigt just sent in these two impressive images of a transport train with three Vectron locomotives and RailAdventures 103 222. Leading locomotive is the multi colored MRCE X4-640 now with TX Logistik logos. For the first time we have a good picture of the complete machine, as this was not possible at the InnoTrans. Behind the 640 we see RailAdventure's 103 222 and Siemens 193 844. All the way in the back we see Siemens 193 971 on loco buggies. The locomotive recently came back from Finland, where it served as pioneer for the VR Group Sr3 series locomotives. Sr3 no. 3305 from the InnoTrans was sent to Finland instead. We post all we see on our InnoTrans Liveblog. At InnoTrans 2014, lease company MRCE had Vectron AC no. X4 E-875 on display. The machine with the slogan 'Connecting Europe' and many pictures on its side. Next week, MRCE will bring its first Vecttron mulit-system locomotive, the designated X4 E-640. In total Siemens will built 21 MS units for MRCE. The 640 will again be a colorful addition to the many vehicles on display in Berlin next week. Lease company MRCE has 21 multi system Vectron locomotives on order. In October 2015, eleven such machines, equipped for services in Germany, Austria and Italy, were purchased. In June 2016 another ten units were acquired. The picture shows Siemens 22164 - MRCE X4 - 640 during its maiden run today, the first of the batch of 11. The Vectron MS is not yet homologated for Italy, so it is interesting to see when this will happen. Now a first customer is awaiting the approval for this country the be able to offer the full potential of this configuration to its customers. We thank Michael Raucheisen for the picture. In 2015, new locomotives were needed, and they were needed fast. DB Schenker, now DB Cargo, made a deal with leasing company MRCE for new Vectron locomotives, to be available at a very very short term. So Siemens took several machines from its stock production line and delivered them to MRCE. It had to go so fast, there was no time to repaint all machines of the latest MRCE batch in black (Siemens builts it stock locomotives in a standard white livery). So it happened that X4E-607 to 613 entered DB service in white, white with MRCE logos. But this livery now belongs to the past. All seven 'albino' MRCE locomotives have been painted black during the past months, including the 610, that is shown in the picture above. This machine is the 22.000th Siemens machine built, and got special stickers by delivery to commemorate this. These are gone now. Lease company MRCE has decided to order another ten Vectron locomotives from Siemens. The new machines will be multi system locomotives with the country specific packages for Germany, Austria and Italy. ETCS will be installed too. Their top speed will be 160 kph and power rating will be the well-known 6.4 MW. Multiple traction with 189/ES64F4 series locomotives of MRCE will be possible. Just nice: a Vectron tandem for DB Cargo (193 607 and 608). Slowly the white MRCE Vectrons are being repainted. 193 612 and 613 recently turned black and now run under designation X4E-612 and 613. This means five as still white, no's 607-611. We already featured the MRCE>DB Schenker white double traction services. As DB Schenker also hires many black MRCE Vectron's, black double's are of course also possible. A picture of 193 602+603 made by Norman Gottberg. MRCE X4 E -613, black, Vectron AC ? Credits go to Jan-Felix Tillmann / Gerd Zerulla / Pascal Schiffner. Last weekend, Siemens production no. 22000 was on display at Munich main station. Helmuth von Lier took this picture, now telling us that the machine will be delivered the MRCE as X4 E - 610 soon. Rail Business reports: MRCE has ordered 21 new Vectron locomotives. Ten units will get the DE/AT package, and will all be delivered in 2015. Eleven other machines will also be capable of running to Italy. These will be the first Vectron MS locomotives for MRCE. With this trhird order, MRCE will have 56 Vectron locomotives in its fleet soon. The first machines are to be delivered on very short notice and will not have the standard black livery. They will be white. The first three units are numbered X4E-607 to -609 and DB Schenker will hire them. 2015-10-02 [EU] MRCE gets more Vectron locomotives..
[EU] MRCE gets more Vectron locomotives..
Eine interessante Dreifachtraktion stand am 5. Juli 2015 im Bahnhof Brenner. TXL 193 603, 193 604, ES64F4-097 und Wagenlok ES64F4-035 bespannten einen UKV-Zug Richtung Norden. 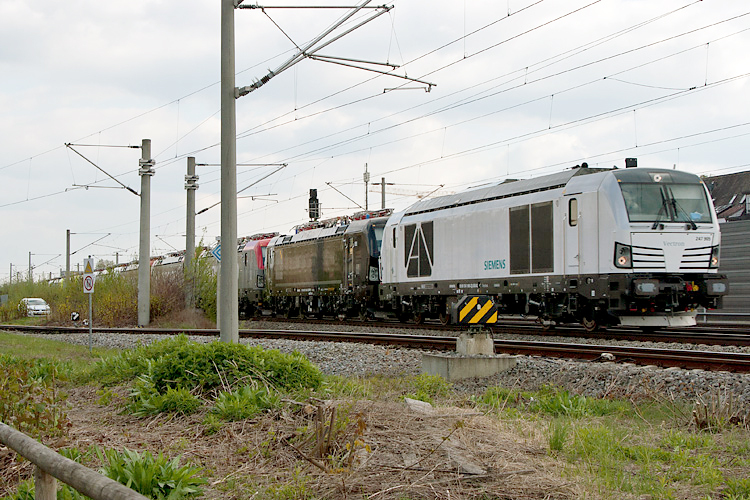 Today, Siemens handed over the last of 35 Vectron AC locomotives to lease company MRCE: X4 E - 606. Delivery completed. Now with an image of locomotive MRCE X4 E - 606. If we have counted right, this is locomotive no.35 for MRCE (X4E-600-606, 850-867, 870-879), which means all known orders (to us) are completed now. On 15.06.2015, MRCE's X4E-605 has its maiden run (see image, check the nice rain shower produced by the pantograph!). On 16.06.2015 the X4E-606 was seen too, with REV date 03.06.2015. First time we see X4 E - 863 with BoxXpress stickers. Freight operator BoxXpress.de currently has the honor to operate the striking X4 E-876 with its 'Tag der Maueröffnung'-livery. Two shots of the machine on freight duty. The image beneath shows the new ELL 193 228, an AC locomotive ready for a test run. More new machines have been seen this morning: 193 222, a multi system Vectron for ELL. MRCE X4 E-602, -605 and -866 are also around. MRCE X4 E - 876 now has the same promotional livery as MRCE>TX Logistik ES 64 U2-060: -Tag der Maueröffnung-. The machine will be present at transport & logistic 2015 in Munich. It will be colorful there. They both are configured for services in Germany and Austria. Both have the standard black MRCE livery. The two machines are no.27 and 28 out of 35 units on order. A new Lea. Last year, MRCE X4 E - 854 was in service of Transpetrol. It than got the name 'Lea'. But, 854 is now in service of DB Fahrwegdienste, so a new Lea had to be found. X4 E - 877 is Lea no.2. BoxXpress.de and the Vectron, they really found each other. MRCE X4E-878 was recently added to the fleet. X4E-861 now has the BoxXpress.de stickers. 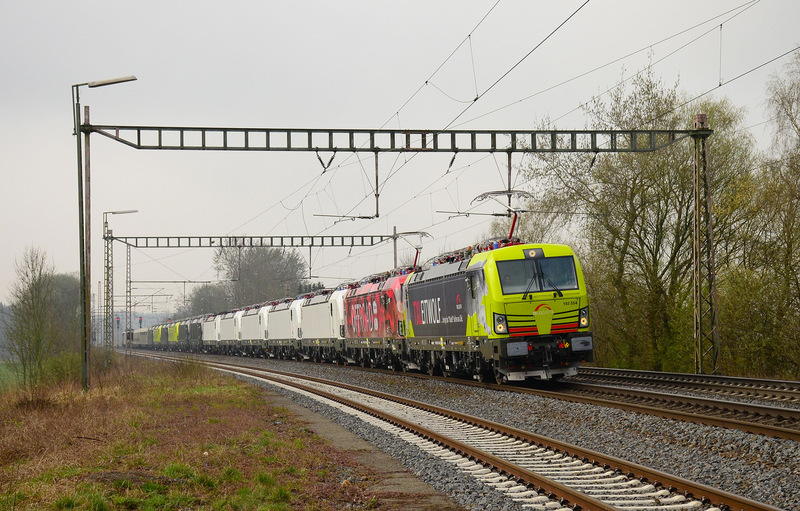 Four MRCE Vectron locomotives on their way to Hungary. Most likely to get passed by the Hungarian railway auhority. The above image shows the newest Vectron locomotive of MRCE. Siemens 21922 / MRCE X4 E - 861 is locomotive no.18 for the leasing company with the black livery. MRCE already operated X4E - 850-860 and 870-875. Siemens took the electric Siemens Vectron AC locomotive no. 193 970 to Berlin. This is a stock locomotive (no.21924) built in 2014 and off-factory equipped for services in Germany, Austria and Hungary. Its top speed is 200 kph and it has a 6.4 MW power output, the most commonly sold configuration for such a machine right now. After 2010 and 2012, it is the third time brings the Vectron AC to InnoTrans, without major changes. The novelties of the 970 are therefore limited to its signalling equipment. After the fair, the white machine will serve as a test bed locomotive in Norway, Sweden and Denmark countries. At the fair the machine was already equipped with the necessary ATC and with ETCS equipment. Siemens Vectron locomotives are already being used in Norway (CargoNet) and Sweden (Bla Taget for example), but the missing link here is Denmark. Once homologation for this country is completed, Siemens will be able to offer its customers a 'bridge'-locomotive, a machine that connects Germany and beyond with northern Scandinavia. Until now only Bombardier has such a product in its portfolio (Traxx AC2 DE/AT/DK/SE/NO). When maintaining the HU-approval for the Vectron, its package could be just a little more complete compared to its Traxx opponent, although it is up to the market if this will become reality. For Innotrans 2014, the 193 970 got promotional marks about Easy Spares. Siemens' program for spare part services. The second Siemens Vectron locomotive at the fair, has a subscription to the event, we guess. It is presented for the third time already (2010, 2012, 2014). It is the one and only diesel-version ('Vectron DE') produced on the basis of the platform until now. In the past four years, the '247 901' designated locomotive has been used for many trials in Germany and Austria, testing many different components. However, this has not resulted in a firm order for the Vectron DE. The market potential of such a machine in Western Europe is limited anyway. The exterior of the machine slightly changed over the years. Promotional stickers were replaced in between the three fairs. This time the 247 901 features a 'Cheetron' or a 'Vectah', symbolizing the efficiency of the 160 kph diesel-electric. Also, the locomotive has not got a destination display up front anymore. During the fair, Siemens announced that it officially received the full authorization of the Vectron DE for Germany. It is the first approval for the DE. With the AC- and MS-variants, now all Vectron-base versions have approval for Germany. Vectron no.3 at Innotrans 2014 was one of Siemens' customers, lease company MRCE, that featured the specially restyled X4 E-875. 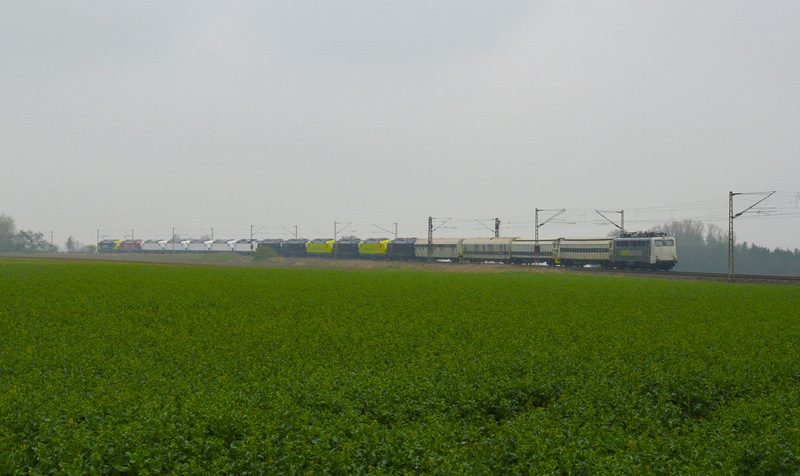 MRCE has currently received 17 Vectron AC-locomotives. Their number will grow to 35 units at the end of 2015. The X4 E series (as MRCE calls its Vectron-machines) must be seen as the successor of the MRCE ES 64 U2 series, being built by Siemens in 2000-2005. One by one MRCE is selling these machines to railway operators. The X4 E-875 is homolgated for Germany, Austria and Hungary and has a top speed of 200 kph. Next to freight operators, it is therefore available to MRCE customers that are planning faster passenger services. Just before the fair, X4 E-875 got a new livery in Munich. This new livery features many important destination cities from all over Europe. Its symbolizes the interoperability MRCE offers to its customers with its locomotive fleet in general. The particular locomotive shown at Innotrans has a much more limited service domain. Additionally, the X4 E-875 has additional logos of its current operator, being Transpetrol from Germany. It is currently one of the heavy users of MRCE Vectron-machines. The locomotive leasing company Mitsui Rail Capital Europe B.V. (MRCE) recently ordered the delivery of further 20 Vectron AC locomotives from Siemens. These locomotives will also be equipped for operation of fast passenger trains. The first locomotive from the Siemens locomotive plant (railcolor: the designated X4E-874) in Munich-Allach, Germany, has already been handed over to MRCE. With this order, MRCE increases its Vectron fleet to a total of 35 Vectron locomotives. The vehicles ordered are intended for cross-border operation between Germany and Austria or between Germany, Austria and Hungary. In addition to the national train protection systems, all locomotives will be equipped with the European train control system (ETCS). The vehicles will have maximum power of 6,400 kW and a top speed of 200 km/h. In addition features required for operating passenger trains will be implemented. MRCE has a fleet of around 300 locomotives in Europe and provides full-service leasing of locomotives. MRCE is a European subsidiary of the Japanese Mitsui & Co., Ltd., and celebrates its 10th anniversary this year. Railcolor: The batch of fifteen Vectron locomotives, now all delivered to MRCE (X4E-850-860/870-873), have a top speed of only 160 kph. With these supplemental batch MRCE is able to offer a more modern alternative to its ES 64 U2 machines. MRCE Vectron are now available for high speed passenger services. Since 17.02.2014, MRCE X4E 872 is hired to Transpetrol. Bräunert Eisenbahnverkehr is operating the locomotive. Today is MRCE Vectron day. Last night, the kick-of was done by X4E 870 and X4E 871 that ran to München-Riem freight station, to pick up their first commercial train to northern Germany. [update] The new Vectrons that will be hired to boxXpress will gradually replace MRCE 189 series locomotive in the boxX fleet. X4E 870 and 871 will only be hired a short while, hence the absence of logos. ES 64 F4-209 is the first one (16.01) that has returned to MRCE. Leasing company Mitsui Rail Capital Europe (MRCE) will receive the the first 10 out of in total 15 ordered Siemens Vectron locomotives this week. The locomotives will be certified for operation in Germany, Austria and Hungary. In the same week during which operator boxXpress.de got its first three new Vectron locomotives, new Vectrons were released from work for lease company MRCE. At the beginning of June the locomotive leasing company Mitsui Rail Capital Europe (MRCE) placed an order with Siemens for the delivery of 15 Vectron AC locomotives. The first locomotives from the Siemens locomotive plant in Munich-Allach, Germany, will be handed over to the customer before the end of the year. This order makes MRCE the second leasing company to choose the new Vectron generation. “We are delighted with this shown confidence, and are certain that with the Vectron we will be able to satisfy all the high expectations for a sustainable solution for the future,” said Karl-Hermann Klausecker, CEO Locomotives and Components of Siemens Rail Systems. The vehicles ordered are intended for cross-border operation between Germany and Austria or between Germany, Austria and Hungary. In addition to the national train protection systems, all locomotives will be equipped with the European train control system (ETCS). The vehicles will have maximum power of 6,400 kW and a top speed of 160 km/h. Some of the locomotives will be equipped with an MS upgrade preparation package that will allow very easy conversion into a multi-system locomotive at a later date. The cabling for additional train protection systems is likewise already on board. MRCE provides full-service leasing of locomotives in Europe, where it has a fleet of around 300 locomotives. The product offered by MRCE is special as it combines leasing with maintenance management of locomotives. MRCE is a European subsidiary of the Japanese Mitsui & Co., Ltd., and has its offices in Amsterdam and Munich. ..is out! Seen today, being transported by Railadventure, heading for Munich.